This high potency joint support formula contains a patent pending combination of PGE-2 inhibitor botanicals along with Glucosamine Sulfate. RELEVE's proprietary formulation is designed to help relieve joint and muscle pain, reduce inflammation, repair joints and cartilage and strengthen bones. RELEVE's patented sustained release delivery system allows for both immediate and long-term action, which lasts for hours. There are few things more discomforting than lying in bed with aching sore muscles after a grueling workout, or having to limit your activity level due to achy joints. Strong enough for the most intense strength athlete, but made for ALL people from bodybuilders to baby-boomers and beyond RELEVE allows you to breathe a sigh of relief as it goes to work directly on your muscles and joints. bringing back comfort once again! IsoOxygene is 20 Times More Powerful! 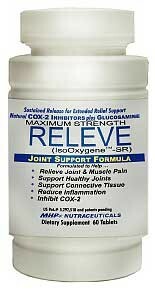 The most powerful natural COX-2 inhibitor on the shelves today, RELEVE is the only natural product with IsoOxygene, a patent pending natural botanical that attacks the COX-2 enzyme responsible for your aches and pains. IsoOxygene is a stunning 20 times more potent than any other botanical currently tested meaning quicker and faster relief for your aching joints and muscles! RELEVE's formula is further enhanced with Baikal Skullcap, N-Acetylcysteine, and Alpha Lipoic Acid a synergistic combination of ingredients that work together to provide fast acting relief and anti-inflammatory action. 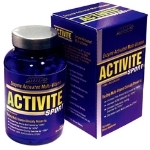 500 mg of Glucosamine Sulfate is added for joint support, mobility and flexibility. And rounding out the formula is a patented, sustained release micro encapsulation system which prolongs the delivery of RELEVE's ingredients for hours! What is COX-2. and Exactly What Is It Doing to My Body? Over the past 10 years, the COX-2 paradigm has emerged, arguably, as one of the most important biochemical systems of the 21 century, and the COX-2 enzyme become a primary model helping to shed some light on our understanding of diverse pathologies such as cancer, osteoporosis, heart disease and Alzheimer's. Most notably, however, is the COX-2 relationship with physical activity. You see, training and general physical activity can place large amounts of stress on joints and the musculoskeletal system, to which the body responds by producing the COX-2 enzyme. These COX-2 enzymes are responsible for making a destructive chemical called prostaglandin E-2 (PGE-2), which in turn, causes joint and connective tissue deterioration, inflammation, and pain within your body. RELEVE's patent pending formula literally blocks the COX-2 enzyme from causing discomfort to your body, allowing you to move freely in complete comfort! Don't let joint pain or muscle soreness limit your potential. If you're looking to make serious progress in your training without debilitating soreness, or if you'd simply like to walk without the worry. Ingredients: Other Ingredients: Guar Gum, Dicalcium Phosphate, Stearic Acid, Calcium Carbonate, Microcrystalline Cellulose, Citrus Pectin, Magnesium Stearate, Silica and Film Coat (Hydroxypropyl Methylcellulose, Hydroxypropyl Cellulose, Polyethylene Glycol, Propylene Glycol, FD&C Blue No. 2 Lake, Titanium Dioxide, and Sodium Citrate). Suggested Use: As a dietary supplement, take two (2) tablets once daily. Or as directed by a healthcare professional. Protect from heat & light. Store at 15-30 degrees C (59-86 degrees F).